Above is the new Mamava Lactation Suite located in Terminal F at Philadelphia International Airport. This pod offers a private and comfortable place for mothers to breastfeed their children, and it is accessed using the Mamava app on a smartphone. 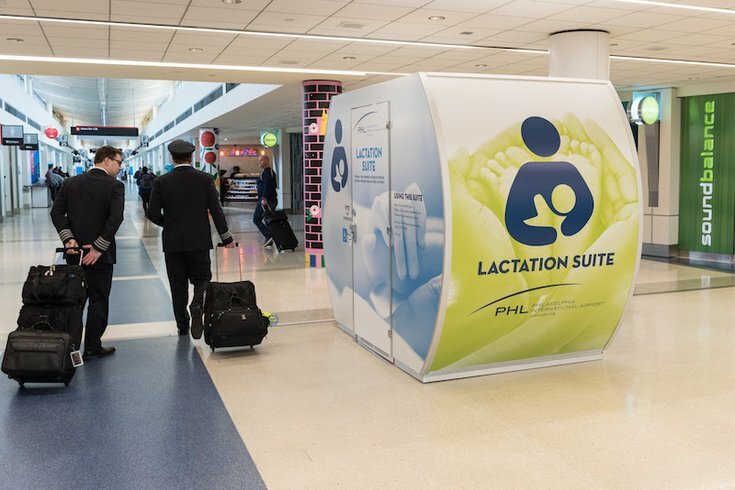 More public places throughout Philadelphia are getting equipped with proper amenities for breastfeeding mothers, with Philadelphia International Airport the latest thoroughfare to offer a lactation lounge. Located post-security in Terminal F – the terminal which has undergone a multi-million dollar makeover in the last few years – is a new Mamava Lactation Suite, a self-contained mobile pod designed for women to comfortably nurse. The four-by-eight-foot pods come equipped with benches, fold-down tables, outlets, and lockable doors and can comfortably fit a traveler with her baby and luggage in tow. Nursing moms can reserve and unlock the pod by downloading the Mamava app, which also offers a map with the locations of other lactation suites. The Mamava app also shows where other “pumping-friendly” places can be found, including PHL’s Minute Suites in the A-B connector. “We are proud to provide another place where traveling mothers can breastfeed and pump milk for their children,” PHL Airport CEO Chellie Cameron said in a press release. PHL’s Mamava installation comes just a few months after the Wells Fargo Center became the first Pennsylvania sports arena to install one.